Another perfectly find day in the Sierra. Actually my last one for some time. My two and a half week Davis stint had come to an end and I was supposed to leave for Belgium in a couple of days. However, not without having done another peak. It wasn't really just another peak as I had done Half Dome six times before, but it never gets boring and I had planned a nightly attack on it this time with a potential sunrise experience on the summit. Another reason to do Half Dome was that Tuyu and her husband Christian were eager to make their first ascent of it. In a way, the trip was also a revival of the Kilimanjaro extravaganza that had kept Tuyu and me busy for five days almost exactly one year earlier. I arrived at their Solano Park apartment at 10pm to find them in various stages of getting ready for the trip. But we managed to get out the door by 30 minutes later and after getting gas left Davis at about 11pm. Tuyu passed out almost immediately in the backseat and would stir little until we pulled to a stop in Curry Village. Christian drove for the first hour until we reached the 120 turnoff in Manteca. I took over at the wheel and with a bottle of Mountain Dew managed to drive all the way to the Yosemite Valley. Some nightly construction in the valley forced us to wait for 10 minutes as their was only one-directional traffic, but at about 20 minutes we pulled into the parking lot at 2:45am and were on our way shortly after. We took the first group picture at the top of Vernal Falls and since there was nothing much to see continued to the top of Nevada Falls. On my previous visits I had always taken the scenic route up to Nevada Falls, but since we did not see much outside the range of the headlights, we would have to enjoy the scenery on the way down. Instead, we took the stairway like descent route and arrived at the restrooms near the falls about 2 hours after setting out. We then moved on the dusty, flat trail through the Little Yosemite Valley and eventually reached the end where the trail began to lead up again. I never enjoy this section very much, because it consists of switchbacks that never appear to be ending. However, after a fairly short period we arrived at the intersection of the Half Dome and Cloud's rest trails. Only 2 miles to go, Yippie. Slowly, we marched on. By this time, the lack of sleep (only about 40 minutes) was catching up with me and I was feeling to begin tired. Luckily we soon arrived at the 7600 tree limit where the stairs leading up to the cables began. This section was already exciting enough to get some adrenalin pumping again and I quickly woke up again and therefore moved a bit faster than before. Arriving at the cable, Christian was enthusiastic about the steepness of the last 400 yards seperating us from the summit. Tuyu's mood was a little more subdued. Maybe fatigue and a little bit of respect of what was ahead also kicked in. Nevertheless, we moved up the cables and spent the next 30 minutes navigating the passages and taking lots of pictures. Amazingly, we had just encounted the first other people on the train at the base of the cables. A group of two young guys and a girl were taking a rest before attacking the cables. 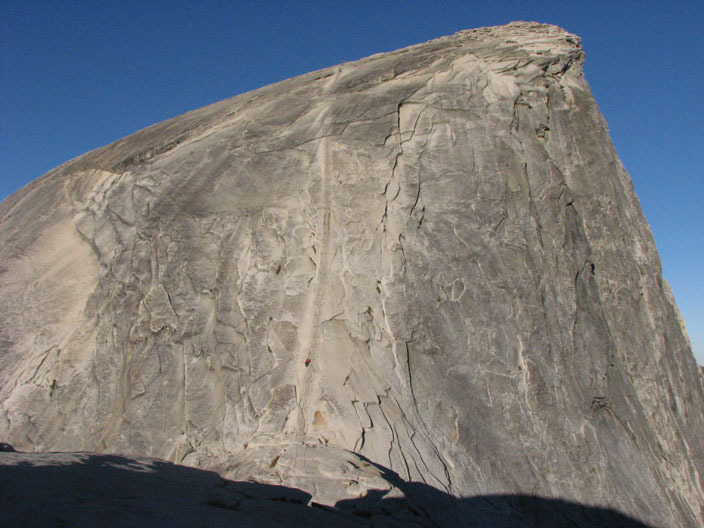 Them and us would be the only climbers on Half Dome for at least 30 minutes, making it a great experience. I had hoped we would be the only ones, but only three others up there, is not bad either. We were not the only once, however, as a group of really early morning risers (or nearby campers) were already descending when we went up. The views from the top were magnificent. We took loads of pictures in all positions including shots of all three of us separatly posing on the "diving board". I also explored the cave underneath the diving board that was so vividly described in the book "Shattered Air". Eventually we picknicked on bread and cheese and I went for a stroll around, while Tuyu and Christian passed out. I had seen on a sign earlier that only one our of an original seven trees were left on the summit platteau. The sign obviously reminded people, not to also destroy the last one for firewood and prohibited camping. I was amazed to find two trees and was glad to see that their seem to be a tree comeback even though the sheer granite platteau structure of the summit puts a clear natural limit on the number of tree out there. It probably maxed out at 7. After about two hours on the summit, we headed down. Lots of people were now coming up and we did not want to get stuck in the cables. We hiked down and had probably already met 80 or so people by the time we arrived at the Half Dome/Cloud's Rest intersection. Here a young bear was in the process of ripping a backback (that had been hidden behind a rock rather than draging it up the trail) to shreds We paused for a while to take pictures and to see the bear's progress. Eventually, he located the bear canister and played around withit. However, not being able to open it, the bear grew bored and left the area. What did that experience teach us? Trust what the rangers say and follow the instructions posted everywhere, namely to hung your belongings of a rope or at least to separate backpack and bear canister. Down at the Merced River, we re-filled the water bottles before skinny dipping at contaminating the water with out sweaty bodies. I managed to stay in the cold water for about 38 seconds before rushing out and drying myself in the sun. A superb moment. I was lying nacked in the grass in one of the most beautiful places on the planet with not a worry in the world. Totally spent I passed out. Soon however, it became apparent that Tuyu was stressed. I learned that on the sumit she had spoken with her babysitter Alex who wanted us to come back at 9pm because he had to get up early the following day. It was already almost 3 when we got dressed again and started down to Nevada Falls. Considering that it would take us about 5 hours to get back, we only had one hour to get back to the trailhead. That also meant that I had only one hour to do the other things I had contemplated doing, which was mainly a hike over to Mirror Lake at the bottom of the Half Dome face, which I had never seen. At Nevada Falls, however, we had to pause again, because a helicopter was in the process of evacuating a hiker who had had an allergic reaction after suffering a hornet sting. It was quite the impressive spectacle, seeing a helicopter take off so nearby. After 10 minutes we continued down the scenic trail and then reached the top of Vernal Falls. We did not stop due to the time constraint and the fact that by now another 1 million people were on the trail as well. From Vernal Fall to the trailhead at Happy Isles we only needed about 25 minutes, which included refilling the water bottle. Not having given up on my plan to see Mirror Lake I continued jogging in that direction while Tuyu and Christian returned back to the parking lot. However when I reached the turn off to Mirror Lake, a sign informed that the distance would be 1.5 miles. With 20 minutes remaining over a agreed upon departure time of 4pm, it was clear that I would not be back in time for that if I chose to go down to the lake. Bummer, but what can you do. There will be another visit and I will get to do it then. I completed the loop around the campground and actually arrived at the bear box to recuperate the cooler before the other two. A few minutes later, I saw there car coming towards me and we left the valley after a brief stop near El Capitan to check out the climbers. At almost exactly 9pm we arrived back in Davis. Really another perfectly fine day in the Sierra and a nice farewell to my trip.